As I have heard and seen so many times, the intense color payoff is formidable. This deeply reddened pink (I feel hesitant to say this, but it's a pink. Excuse me.) is mesmerizing but could easily scare off many. I've been saying that opaque blush swatch strips on arm often are useless (although looking at them usually exudes rush and happiness for us beauty addicts), and maybe only good for exercising our imaginations. 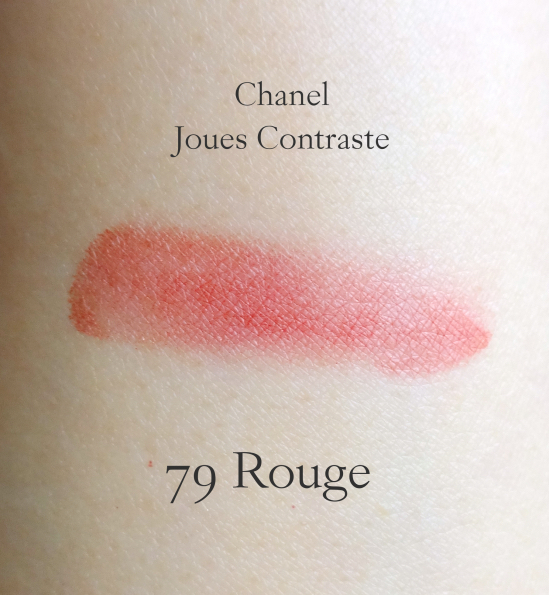 Chanel Joues Contraste Rouge is the very example, I say. I didn't rub my finger on the blush. I gently "put" my finger on it. And ta-da, a lipstick swatch. On my arm it isn't exactly blendable, either. Once a chunk of the pigment landed on skin, that's it. You can certainly count on the lasting power. I think girls with deeper skin tones would find Rouge a lot easier to work with. If you have fair to light skin tone like me, you need to have a right tool and an extremely light hand. I have a small brush designed for mineral foundation that actually works quite nicely for Rouge. This brush doesn't pick up too much powder, but I still make sure it gently kisses the blush and pre-blend the color on the back of my hand before it touches my cheeks. The usual blush application technique, swirl-n-tap? You mustn't. Don't even. 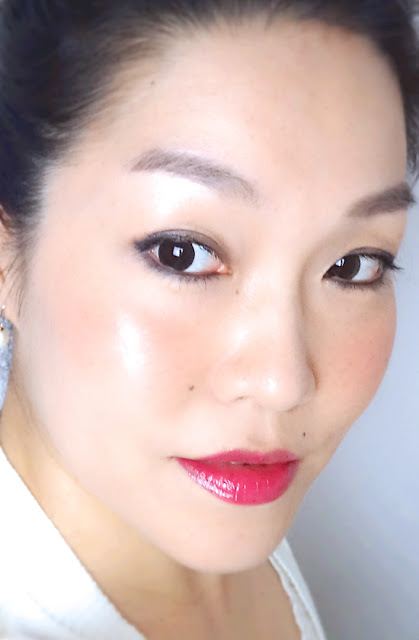 If I do everything right, Chanel Joues Contraste Rouge lets me have the most gorgeous naturally flushed cheeks that glows. I never thought I could enjoy this saturated red blush in summer, but apparently I do. Surprisingly it doesn't make me look like I've boiled myself in sauna, either. I just need to strictly abide by this "less is more" rule. I think I could play it a tad bolder when the air cools down, to which I will look forward more than the new season itself. 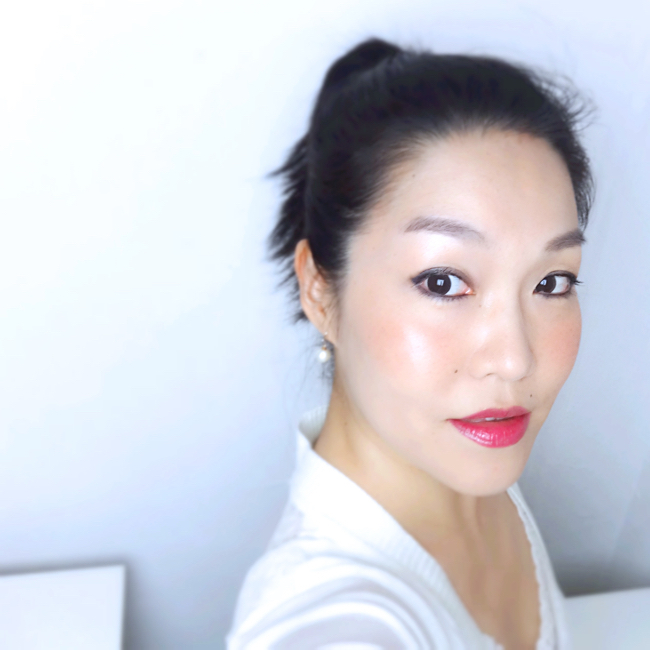 With Canmake Cream Cheek CL01 (reviewed) and NARS Blush BLKR 413 (although this one is more of a reddish rose), Rouge completes my red blush wardrobe. I don't think my heart would want another red blush any time soon, but anything else I missed? I mean, just in case. Ha now come to think of it I really don't own a reddish blush at all! This stayed available here for quite a while, but I borrowed it from a friend and decided it's too intense for me. It's really pretty on you tho! It took me a really long time to start my small collection, too! The first few I tried didn't look good, either. I've seen Rouge looking lovely on you, but didn't want to ask you why you're letting it go. LOL. Looks perfect on you!! And you're right-it's all about the tools and application with pigmented blushes for fair skins! We can wear them-just takes practice. I've actually been looking for a good red blush. I have a Magenta red one that gives a similar effect but its not a true red. Kind of wishing I'd know about this one, hehe. Tarte Natural Beauty would be another good one if you're looking for a powder blush. This one leans more pink but appears red on skin. Though slightly tricky to use, I love red blushes. I think they give the most natural flush. I have the Canmake shade you mentioned which I adore! Mac Scarlet also looks amazing but is more of a pinky red. I totally agree with you. And Rouge is known as a color that mimics naturally flushed cheeks. Oh, I love red blushes too but I favor cheek stain over powder. Essence renesmee red is the only powder I have and I feel like it will last me a life time....besame crimson rouge is a really cute vintage-looking flush but I thought it's more of a pink though. Wow, that blush looks like a work of art in the pan! I like how surprisingly delicate the color is on you. I don't own any red blush (the closest I have to red is Face Stockholm Paris, which I almost never wear), but I see that it's not necessarily garish once applied. Gorgeous! My 'reddest' blush is probably NARS Exhibit A, though that one is actually more orange than red. I really love the look of this one, it looks beautiful on your skin. Exhibit A is another amazing (and intense) shade. These two would be in most pigmented blush top 5 in the world. 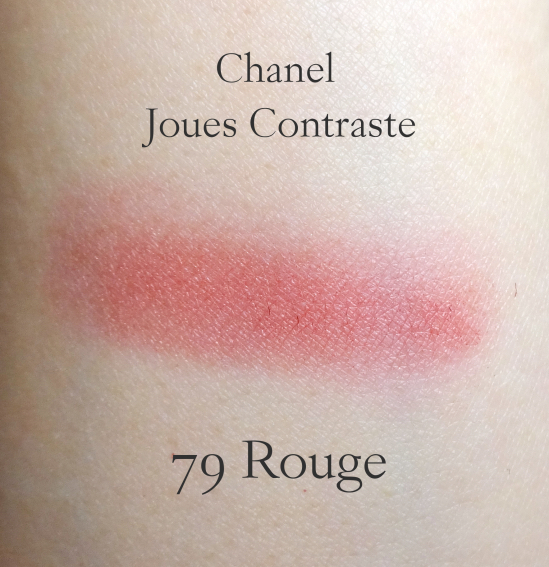 ;D Joues Contraste has a softer texture than NARS blush in general, so this need an extra light hand! Ah, I love red blushes! Even on fair skin they can look so natural when applied with a light hand. MAC Frankly Scarlet is one of my faves :) This shade is gorgeous on you! Oooo how interesting! I've only ever owned one blush that looks reddish or is a red base and I rarely use it but love it when I do. I really love the reddish burnt earth tone to this on you. 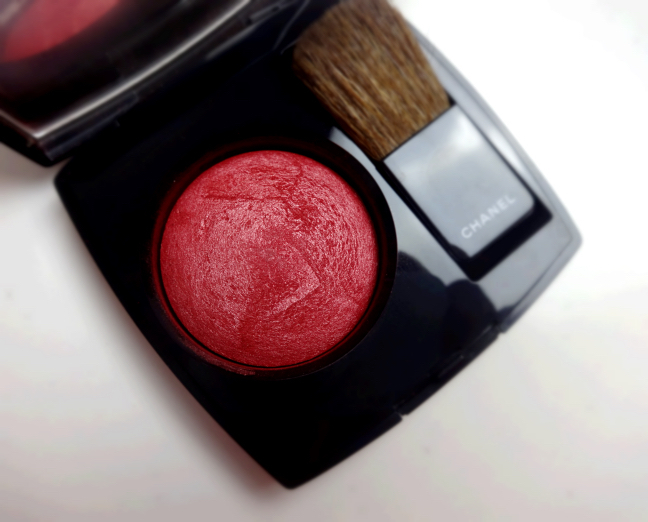 I would be scared of something so red to be honest but I would LOVE a chanel blush right now! Chanel blush is excellent! I often wondered why their baked eyeshadows (before reformulations) didn't perform as well as their blushes since they both are baked ones! Happy now I have Rouge in my hand. Not only the color is beautiful, but also will it last forever since I only need very little to achieve the desired look. That's great you got a tester of this. I feel generally same as you when it comes to red blushes. They are so easy to go wrong if you what I mean! Gorgeous! I prefer more terracotta reds on myself, or at least something a touch warmer (like Becca Strawberry), but I like it on you! And lol, that is indeed an intense blush. Sometimes I like having intensely pigmented blushes around, but most of the time I don't want to have to work so hard :P My Shiseido Camellia blush is maybe this color though actually, now that I think about. I'll have to go pull it out again. I remember the Shiseido Camellia! It is quite gorgeous! I also see some pink in this red blush, which is very interesting to me.